This is still one of my favorite books, even though I haven't read it since 8th grade! It's terribly heart wrenching... But that's what makes it amazing! I freaking love this book. It is so deep and the characters are so well developed. I’m usually not into historical fiction, but this book really hits the spot. I love Rudy and Liesel’s friendship and I’ve read it three times. I will still never get over Rudy’s death. I would recommend this book to anyone and it really spreads a light on what happened in World War II. This book devastated me. I just finished it and I've spent the last half hour trying to read between tears. Going into this book I knew only a little, Germany during World War II, a young girl, books and a Jew. This book though... The use of language, the imagery is simply gorgeous. It's heart breaking in so many ways and yet, gives such hope in the goodness of people. Lisel and Rudy will join Anne Shirley and Gilbert Blythe and Emily and Teddy as perfect child couples. I've just finished this book, still wiping the tears from my eyes and I know that I will return to this book in the next couple of years. This book is damned near perfect. I love it! Depressing, heartfelt, amazing.❤️.....and there’s Rudy. I have a coworker who knew I was reading this and when I mentioned I was done with the book he asked me how I liked it. "It was good; but..." I said and he smiled and agreed. There are places where the book is fantastic, haunting, and extremely well written. The words mesmerize and the text flows. You are placed in a this odd place of sorta following the Grim Reaper as he collects souls and becomes enamored with Liesel. The ending you're flipping pages determined to find out what happens-to Liesel, her parents, Max, and Rudy. Then there's the middle. I can't begin to imagine how to tell this tale in the middle of WWII in Germany and yet make life somewhat normal. This is a story of Liesel and her young teen years. There's air raids, rations, and the lack of books but there's growing up, dealing with bullies, secrets, and pettiness of those years. How do you make the story compelling without much happening and yet everything happening? Well, Zusak sorta figures that. However, the middle is where I got bogged down and was moving at glacier speed. So, would I recommend it? If you've heard about the book and are interested, give it a shot. I can't jump up and down and say it's fantastic but it's a really solid, well written book. Overall, I am glad I picked it up and stayed with it to the end. The Book Thief tells the story of the other side of Germany during Word War II, showing readers that war and suffering affects everyone. 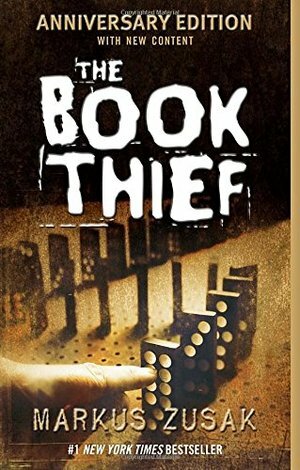 The Book Thief handles its heavy subject matter with clever wit, making it easier to digest but still allowing its impact to be felt. Wonderful, eloquent, and moving. An emotional combination of creative fantasy, historical ficiton, and children's writing. I loved everything about this book! It is so beautifully and cleverly written!